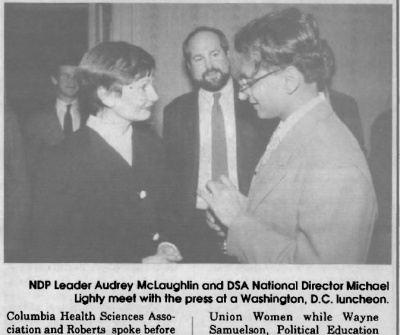 The Democratic Socialists of America Health Care Speakers Tour of 1991 featured twenty Canadians speaking in twenty-four U.S. cities to trade unionists, senior activists, students, women's groups, health care providers, members of Congress, and local legislators. "The administration of your system costs about five times as much as ours does," Dr. Mimi Divinsky said in an interview with National Public Radio during the Speakers Tour. The Canadian speakers explained that their health care system was the result of years of hard work by the New Democratic Party , the labour movement, and progressive doctors organizations such as the Medical Reform Group of Ontario. The NDP, a democratic socialist party is DSA's sister party and a member of the Socialist International. "Now, no party - left or Tight — can touch the health care system. That's how popular it is," said MP Chris Axworthy at a public meeting in New York. "Even our Conservative federal minister of health admits that ninety percent of Canadians support our health system," said trade unionist Julie Davis at a labor breakfast in Washington, D.C. The Speakers Tour educated and inspired DSA'ers and other health care activists, giving them invaluable organizing tools. The Speakers Tour was a "tremedous success, thanks to the expertise of our Canadian speakers and to the relentless organizing of DSA local and Youth Section activists across the country. Through the Tour, DSA added a significant voice to the fight for universal, single-payer health insurance -- helping to push it to the top of the agenda, both locally and nationally. In the keynote of the Democratic Socialists of America Health Care Speakers Tour, Audrey McLaughlin, Leader of the New Democratic Party, met with members of Congress, trade unionists, and media in Washington, D.C. Democratic Socialists of America, AFSCME, and the American Solidarity Campaign organized a Congressional breakfast, press luncheon and labor reception for McLaughlin. They also set up meetings with House Majority Whip David Bonior, Congressman Marty Russo, UMWA President Richard Trumka, and AFSCME President Gerald McEntee. Los Angeles DSA organized a whirlwind of public events, media interviews and receptions. Deborah McPherson, President of the British Columbia Nurses Association, Ken Georgetti, President of the British Columbia Federation of Labour, and William Roberts, Member of Alberta's Legislative Assembly spoke at a forum attended by 175 people and a UCLA event attended by 150 people. The speakers were interviewed by the LA Weekly, Santa Monica TV, and radio host Phil Ansell, a DSA'er. "We made an important contribution to a front-page issue,"said Steve Tarzynski of LA DSA. "The Tour influenced a lot of activists,trade unionists and public policy makers." In the East Bay, DSA'ers put together a wide range events, from a legislative hearing to a reception for doctors and medical school students. Dr. Rosana Pellizzari of the Medical Reform Group, Peter Cameron, President of the British Columbia Health Sciences Association and Roberts spoke before a standing-room-only crowd at a public forum in Oakland. In addition, the speakers were interviewed by the editorial boards of the San Francisco Chronicle and the San Francisco Examiner. Columbus DSA sponsored an event which was broadcast on DSA'er Bob Fitrakis's cable TV show, "From the Democratic Left." In Cleveland, the speakers were featured on several radio talk shows. Kathleen Connors, President of Canada's National Federation of Nurses' Unions and Judy Wasylycia-Leia, Member of Manitoba's Legislative Assembly, addressed the Coalition of Labor Union Women, while Wayne Samuelson, Political Education Director of the Ontario Federation of Labour, spoke to the Building Trades Council. The Oberlin DSA chapter held a public meeting with the speakers. St. Louis DSA organized public forums at St. Louis University School of Community Health and Washington University. Don Aitken appeared on a cable TV show, "Labor Vision." Aitken was also interviewed by several radio shows and the St.Louis Post-Dispatch. At the UAW Educational Retreat Center in Black Lake, Michigan, 300 trade union activists gave a standing ovation to Dr. Gordon Guyatt of the Medical Reform Group and Wasylycia-Leis. Chicago DSA held a labor breakfast meeting, addressed by Don Aitken, President of the Alberta Federation of Labour, Guyatt, and Wasylycia-Leis at AFSCME District 31. A DSA public event featured the Canadian speakers as well as DSA'er and Physicians for a National Health Program President, Dr. Quentin Young. Purdue University DSA organized a labor event. McKendree College DSA and Northern Illinois University DSA both organized student forums. New York City DSA sponsored a series of events over a span of five days. Events included a reception for physicians and providers, a meeting with the general executive board of ACTWU, a labor breakfast with Jobs with Justice, and a City Hall meeting with DSA'er Manhattan Borough President Ruth Messinger. The speakers met with the editorial boards of the New York Times and Business Week. "We helped to energize and educate the health care activists in the city," said DSA'er Steve Oliver. "Because of the Tour several public officials have announced that single-payer health care reform will be at the top of their agendas." In Philadelphia, Barbara Beyers, President of the Saskatchewan Federation of Labour and Guyatt spoke to 125 trade unionists at a labor luncheon hosted by Henry Nicholas, President of 1199. Philly DSA'ers also organized a health care activists conference, a senior activists event attended by U.S. Congressman Bob Borski, a forum for health care professionals co-sponsored by Physicians for a National Health Program, and labor events in Camden and at the Rutgers University Labor Education Center. Central New Jersey DSA sponsored a meeting at Princeton University that was attended byover 100 students and faculty and by the president of the university. Baltimore DSA held a meeting at Johns Hopkins University and public event attended by over 100 people. The speakers met with the Baltimore City Council, Citizen Action, trade unionists and community health professionals. DC/MD/NoVA DSA sponsored a labor breakfast with Julie Davis, Secretary-Treasurer of the Ontario Federation of Labour. In addition they organized a series of events and meetings with the speakers and Congressman John Conyers, and the staff of Congressman Bernie Sanders. This page was last modified on 14 April 2011, at 04:21.